I wear very little makeup… mostly eyeliner, mascara and lip color… so skin care is an extremely important part of my daily routine. As my skin ages and becomes drier (hello mid-50’s! ), I’m on the lookout for products to help keep it clear and moisturized. 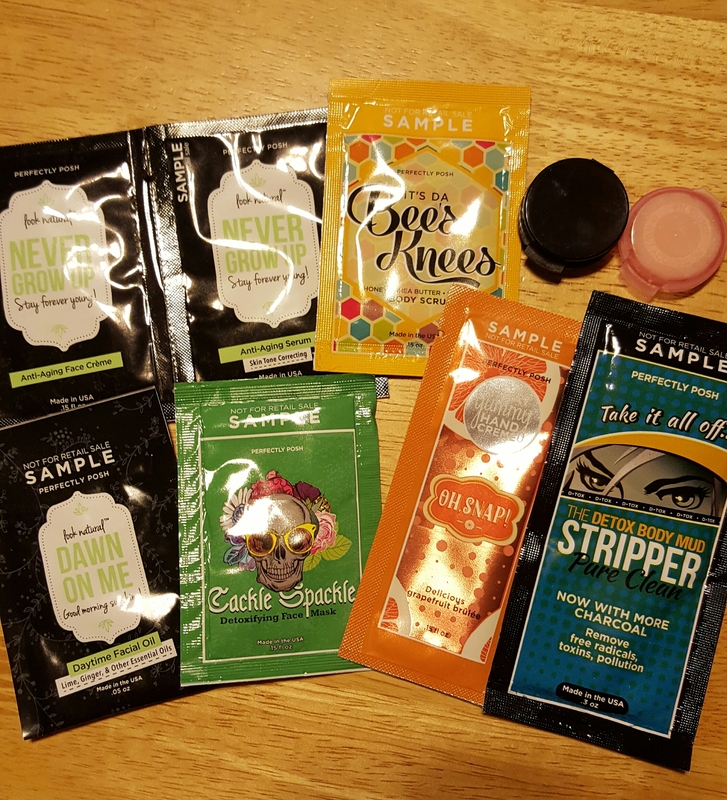 When my friend Lissa offered to send samples of products from Perfectly Posh in exchange for feedback, I was intrigued. Like me, Lissa rarely wears foundation and I think her skin looks amazing. She’s been using their products for a couple of years and loves them so much that she became a consultant last year (admittedly the discounts don’t hurt either). As the name implies, Perfectly Posh is about pampering yourself from head to toe. After reading about the company and products (some of which are vegan) I like that they’re made in the United States with natural ingredients, like nut butters and essential oils, doesn’t contain parabens, paraffins, sulfates or lanolin and does absolutely no animal testing. Dawn On Me Face Oil: I love the lime/vanilla scent. The sample was generous enough for a few applications. A little goes a long way. The first time I used too much and my face felt oily so I blotted it with tissue and wondered how anyone could apply makeup afterwards without it sliding off. It wound up absorbing well and my face felt dewy. That is until I visited my daughter later that day and her pooch, Braxton, apparently also liked the scent and licked my entire face which made me think of the headline “I tested, Braxton approved.”! Verdict – This is a great facial moisturizer. My only concern is the lack of SPF so “facing the world au naturel” isn’t advisable. Will use with facial sunscreen. PS… this is Braxton. Isn’t he a cutie?! It’s Da Bee’s Knees Body Scrub: The scent is of raw honey which some folks aren’t fond of but I like it. It’s thick but spreads well. The sea salt did a great job of exfoliating my arms while the shea butter left them soft. Best of all, there was no greasy residue on my skin or in the tub as with some body scrubs. Verdict – With the summer coming up… along with bare arms and legs… the scrub will be a great addition to my body care routine. Cackle Spackle Face Mask: Great name and the charcoal mask does resemble wall putty. But, holy cow, SPEARMINT! Not just the scent but also the STRONG tingly sensation when I applied a thin layer on my freshly washed face. I didn’t even wait the minimum recommended 5 minutes and thought for sure that my face was red and splotchy underneath. After working a bit with a wet washcloth to remove the mask, what I did uncover was smooth skin with smaller pores and nary a splotch. Verdict – While the result was promising, the tingle was too much for my liking. Skipping this but recommend for those without sensitive skin. The light grapefruit scent is delightful and the cream absorbed well into my skin with no greasy feel. However, the sample didn’t provide enough uses to determine long-term effects. Verdict – An order is in order to see how it will treat my dry hands in the long run. The Stripper Detox Body Mud: The package warns “This is an aggressive, deep cleansing product. Not recommended for face or other sensitive areas.” After my experience with Cackle Spackle, there was NO WAY this would go anywhere near my face so I tested it on my inner arms from the wrist to the elbow. Subtle vanilla scent and no tingly sensation, yay! As with the Spackle, it took longer to rinse off but my skin felt clean and fresh. I can only imagine how great the rest of my body would feel after a neck-to-toes treatment. Verdict – At $24 for 8 ounces, it’s considerably less pricey than the spa. Oh, Peaches! Sugar Lip Scrub: Smells and tastes delicious! Yep, you can lick it off your lips after using it to exfoliate them. It does a great job of smoothing dry, chapped lips. Verdict – Not sure the $12 price tag for 1/2 an ounce is justifiable when I achieve the same result with a dry toothbrush and Vaseline although it’s definitely not as tasty. Never Grow Up Serum and Never Grow Up Face Crème: As part of a night time routine, these products contain lots of moisturizing oils and caffeine to help even skin tone and diminish fine lines & wrinkles. The samples were good for 4 days which was enough to notice the benefit. The next morning, my face felt soft and hydrated. The only curious thing is that, although they’re to be used together, the serum and cream have completely different scents. However the lavender/lemon of the serum is very light.. I detected more of the cream’s coconut/vanilla. Verdict – Nice results for a fraction of the costs of other anti-aging products. I’m Turning Blueberry Soothing Face Mask: It had me at “soothing”. With yogurt powder and blueberry seeds and extract, this mask lives up to that word. The title made me anticipate looking like Violet Beauregarde from Charlie and the Chocolate Factory but, as you can see, it’s very light in color. It rinsed off easily and left my face feeling velvety smooth. Verdict – I’m a fan! I hope my reviews have been helpful but encourage you to ask for samples and see what works best for your skin and body. If you don’t know a Perfectly Posh consultant, check out Lissa’s site. Until next time, beautiful people, don’t forget to spend time on YOU. Do what brings you joy, gives your body rest and recharges you without feeling an ounce of guilt. Self care is the best and most important act of self love.